This bestselling book forced Edgar Wallace to declare bankruptcy. It was adapted as a silent film twice, and as a British television series in 1959. [This edition includes the first book in the series—The Four Just Men, as Part I—and its sequel, The Council of Justice, as Part II. Four young, handsome, immensely wealthy vigilantes (including a European prince) who kill people in the name of Justice. 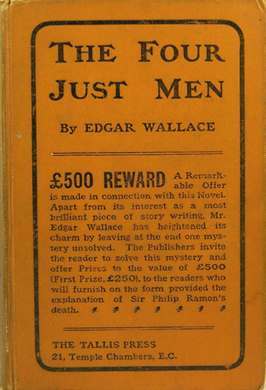 The eponymous "Just Men" appear in several sequels. — Excerpted from The Four Just Men on Wikipedia, the free encyclopedia. The Outrage at the "Megaphone"
This page was last edited on 26 June 2018, at 08:27.